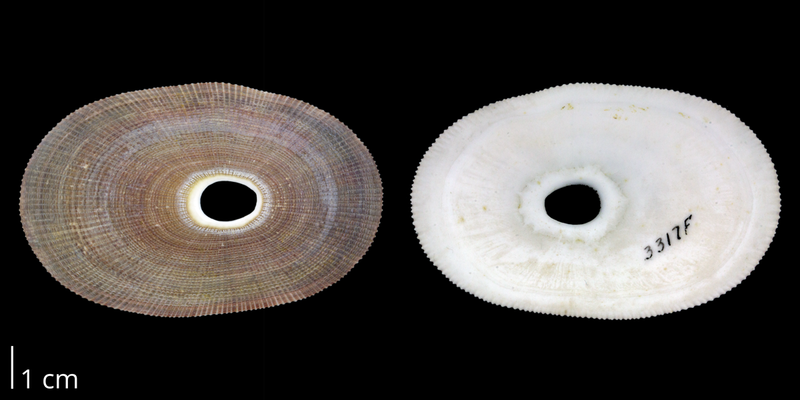 This clade of Gastropoda is entirely marine and includes species with both coiled and limpet-like forms. A distinctive feature of many Vetigastropods is the presence of a slit or one or more holes on the shell. Some examples are below. The Pleurotomarioidea–or, slit snails–take their name form the long slit that indents the last whorl of their shells. Modern Pleurotomaria teramachii from Taiwan, collected at depth of 200-300 m (PRI 70103). Another group of Vetigastropoda, keyhole limpets (Fissurellidae), have a hole at the top of their cap-like shell. Their name comes from the shape of this hole. Modern Megathura crenulata from California (PRI 70102). 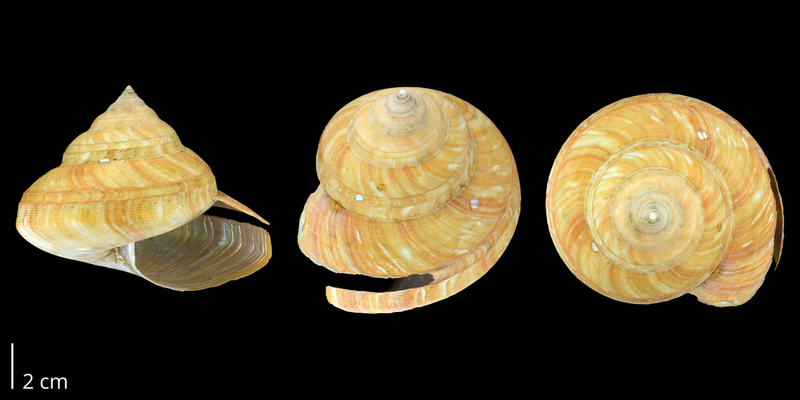 By far the most famous of the Vetigastropoda are the abalones (family Haliotidae, genus Haliotis). Modern Haliotis rufescens from California (PRI 70105). These large snails, which have a series of holes in their shell, are edible and considered by some a delicacy. As shown in the video below, attempts are currently underway in some areas to farm abalone. 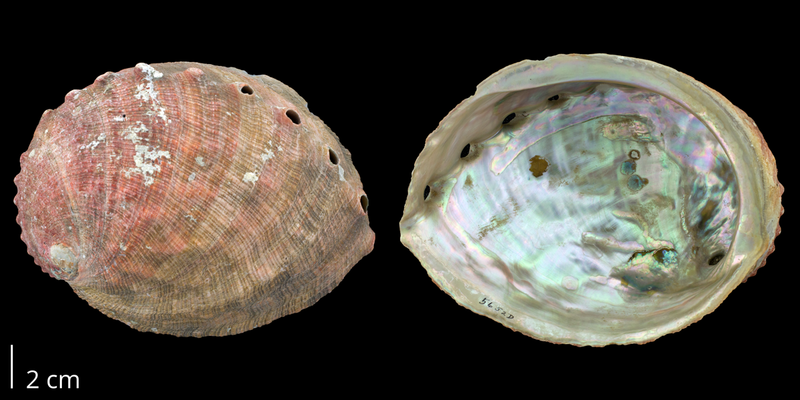 In addition to being a food source, the nacreous layer of the inner shell has long been a source of mother-of-pearl (see image below). Mother-of-pearl has long been used as a material for clothing buttons, among other uses. Modern Haliotis irus from New Zealand (PRI 70101). 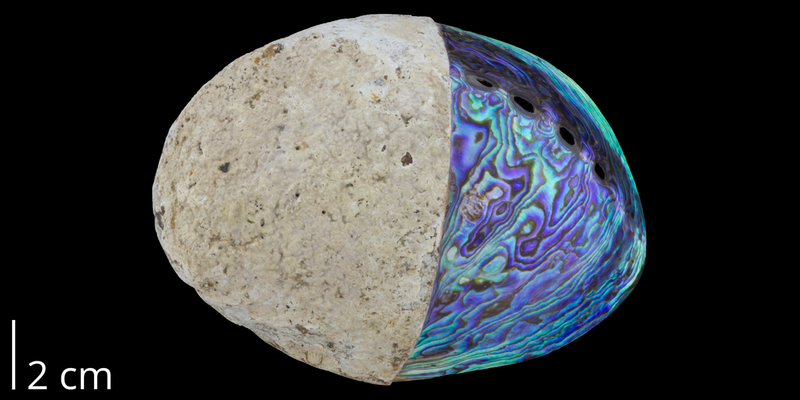 The top layer of shell material has been removed from the right-hand of the specimen, revealing the nacreous layer beneath. Vetigastropods likely originated in the early Paleozoic (Zapata et al., 2014). Gofas and Bouchet (2010) recognize the following gastropod families as members of the Vetigastropoda († indicates extinct families). This list was copied from the World Register of Marine Species (WoRMS) on February 7, 2017 and is reposted here in concordance with the source material’s Creative Commons BY 4.0 license. The link associated with each name will direct you to additional information about that family on WoRMS. Gofas, S. and P. Bouchet. 201. Vetigastropoda. Accessed on February 7, 2017 through: World Register of Marine Species at http://www.marinespecies.org/aphia.php?p=taxdetails&id=156485. Zapata, F., N. G. Wilson, M. Howison, S. C. S. Andrade, K. M. Jörger, M. Schrödl, F. E. Goetz, G. Giribet, and C. W. Dunn. 2014. Phylogenomic analyses of deep gastropod relationships reject Orthogastropoda. Prooceeding of the Royal Society, B, 281: 20141739. DOI: http://dx.doi.org/10.1098/rspb.2014.1739. Link.